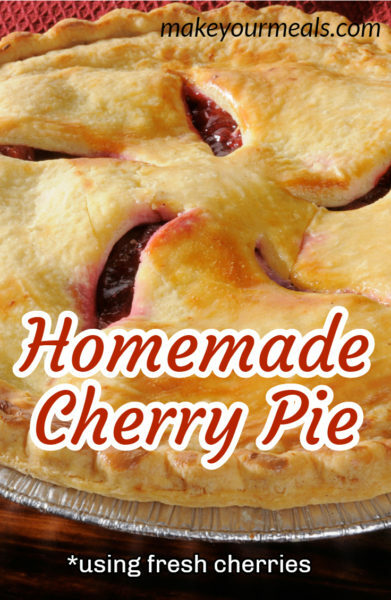 Making a homemade cherry pie is easier than you think! When most people think about making a homemade cherry pie they immediately head to the canned dessert aisle at the local grocery store and pick up 2 cans of cherry pie filling. A delicious slice of homemade cherry pie served with vanilla ice cream. 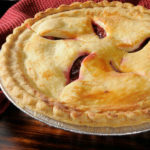 And although a pie made with canned pie filling is easy and delicious, there is just something satisfying about making your own homemade cherry pie. Of course, there is a little bit of patience that is involved. Especially when using fresh cherries. You must take the time to remove the pit and cut each cherry in half. Believe me when I say this – you will be very happy if you have a cherry pitter. It will save you so much time and reduce your frustrations if you have this handy kitchen tool. 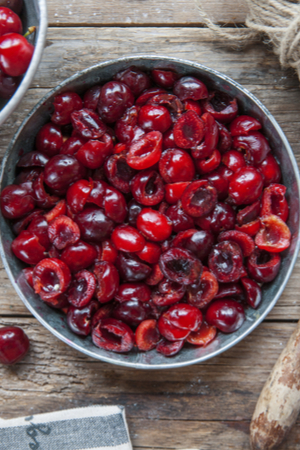 Sweet cherries are preferred for this recipe so that you can use less sugar. This is where I wish neighborhoods had a lending kitchen library. The kind where all of those hardly every used, but very important, kitchen tools where there for the entire community to borrow when needed. That way not every kitchen would have to store kitchen utensils that are used only once or twice a year! 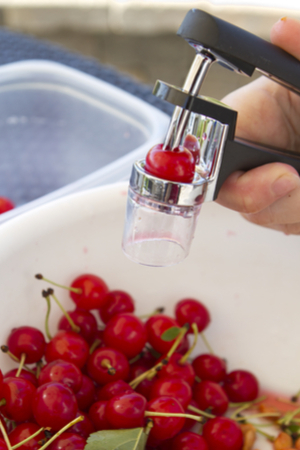 The most ideal tool to pit the cherries is definitely a cherry pitter. The speed and accuracy of this device is incomparable to anything else. A cherry pitter will make pitting the cherries a breeze! However, there are other ways you can pit the cherries as well. Now remember, it will take you longer and you may become a little more frustrated, but it can be done. Place a cherry on top of an opened bottle. Take the flat end of a chop stick and push it through the top of the cherry. The pit should push out the other end and fall neatly inside the bottle for easy clean up. Place your pastry tip, point side up, on top of your work surface. Lower the cherry down onto the tip until the pit comes out the other end. All of the cherries have been pitted and sliced in half. Take a standard paper clip and unfold it in the center, leaving the curved edges intact. Push one end into the center of the cherry and pull out the pit. Similar to the chop stick method, place a cherry on top of an opened bottle. Push the straw through the center of the cherry until the pit falls out. 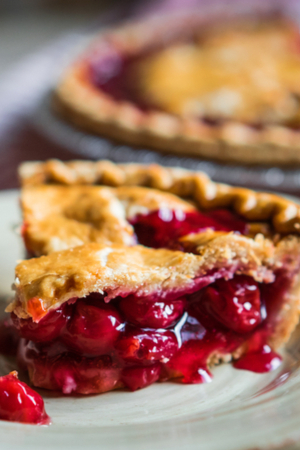 Congratulations, you just accomplished the hardest task of making a homemade cherry pie! Cherries being tossed with the rest of the filling ingredients. Now comes the easy part – making the filling. This recipe is based on using sweet cherries for the filling. We prefer to use Rainier and Black Sweet Cherries in this recipe. However, any sweet cherry will do. You can certainly use tart cherries. However, you will need to increase the amount of sugar that you add to the filling from 2/3rds to at least 1 cup. Once you combine the filling ingredients together, immediately place it in the refrigerator to set up. A slice of homemade cherry pie. Keeping everything cool helps decrease the chance of excess liquid being formed which will result in a runny pie. If you have a favorite homemade pie crust that you enjoy making, by all means do so for this recipe! Although I have a great pie crust recipe that I love and that never fails me, I have to admit, I often buy pre-made, packaged refrigerator pie crust. They come out light and flaky and honestly, there are some days that I don’t have time to make the crust myself. So whether this is truly Homemade Cherry Pie or Semi-homemade Cherry pie – the results turn out fantastic! And regardless, you can tell everyone that you didn’t use canned pie filling! Check out our Homemade Pumpkin Pie and our Peach Cobbler dessert recipes as well. 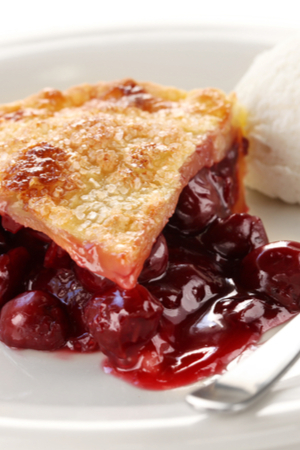 Sweet and delicious homemade cherry pie made from fresh sweet cherries and topped with a beautiful golden crust. 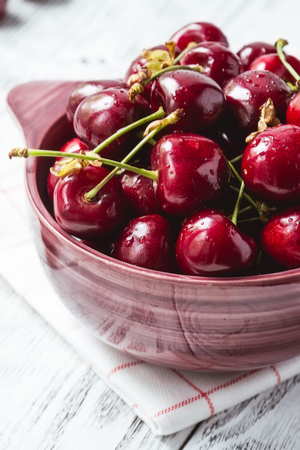 In a large bowl combine the cherries, sugar, cornstarch, lemon juice, vanilla extract and almond extract and stir well. Place the filling in the refrigerator for at least 30 minutes. Follow the directions of the package of store-bought pie crust for a 2 pie crust pie. Or make your own pie crust and put the bottom layer in a 9 inch pie pan. Pour the cooled cherry mixture into the crust. Cut the butter into small sections and dot the top of the cherry filling with butter. Moisten edge of bottom crust with water. Place top crust on and crimp and/or flute the edges of the crust together. Make a several slits in the middle of the crust for steam to escape. Sprinkle the top crust with sugar. Bake for about 50 minutes until the filling is hot and bubbling and the pie crust is brown. *Cover edges of the crust about half way through the cooking time if becoming too brown. Remove from the oven and place on a rack to cool. Once completely cool, store in the refrigerator until ready to serve. 1 ½ pounds of cherries yields approximately 4 cups. We prefer to use a combination of rainier and black sweet cherries. 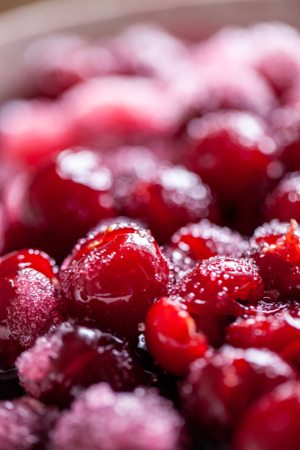 If you use a tart cherry variety, increase sugar to 1 cup. Since fresh sweet cherries are not in season, can I use some I froze this summer? What adjustments should I make, since thawed cherries will probably be juicier? Hi Ruth. You are absolutely right that the cherries would produce a lot of juice. I have never tried it with frozen cherries (for that reason), but if I did, I think I would add a thickener to the cherries (maybe toss them in flour?). Just guessing though. Let me know how it turns out if you make it.